Construction trailers are mobile structures (trailers) used to accommodate temporary offices, dining facilities and storage of building materials during construction projects. Typically, trailers need to be equipped with telephone lines and electrical power. Lavatories are usually provided for separately. They are often skid-mounted, on trailers, or put on piles. Construction trailers are often manufactured using traditional stick-frame construction. Intermodal containers are also being converted into construction trailers. Municipalities can require the use of construction trailers to be subject to permit proceedings. The City of Fremont, California, for example, publishes its permit requirements on its municipal website. Enclosed Cargo Trailers are a very popular tool used by many in the construction industry. Keeping equipment and materials clean and dry are a high priority to anyone that construction industry. These trailers are very user friendly and are multipurpose. Hauling generators, ladders, air compressors and other small to medium sized power tools from one job site to the next is a necessity. Construction trailers are ordinarily moved by heavy trucks but may also be moved by rail. There are people in Europe, especially in German-speaking Europe, who live in trailers of this type, and in German there are words for a congregation of these trailers, Bauwagenplatz and Wagenburg. In 2008 Norwegian media reported that two construction sites (of Byggmester Harald Langemyhr AS) had been housing Polish workers in construction trailers — 4 workers in each. ^ "City of Fremont, California municipal website". Retrieved 26 November 2010. ^ "Forsiden". www.dn.no. Retrieved 8 August 2018. 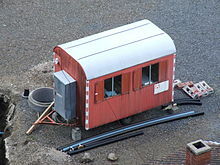 Wikimedia Commons has media related to Construction trailers.